Belgium produced a brilliant performance to knock five-time winners Brazil out of the World Cup and reach the semi-finals for the first time since 1986. Roberto Martinez's side turned on the style in Kazan to clock up their fifth straight win of the tournament and ensure the semi-finals will be contested by four European sides for the first time. Brazil had conceded just one goal in their past four games in Russia but were behind early when Nacer Chadli's corner struck Fernandinho's arm and flew into the net, the 10th own goal of this World Cup. Fernandinho's Manchester City team-mate Kevin de Bruyne doubled Belgium's lead with a sublime arrowed finish from 20 yards after Romelu Lukaku's powerful run. Impressive Belgium will now face France, 2-0 winners over Uruguay earlier on Friday, in a semi-final in St Petersburg next Tuesday, 10 July (19:00 BST). The other semi-final in Moscow on Wednesday 11 July will be contested between the winners of Saturday's quarter-finals featuring Sweden and England (15:00 BST) and Russia and Croatia (19:00 BST). 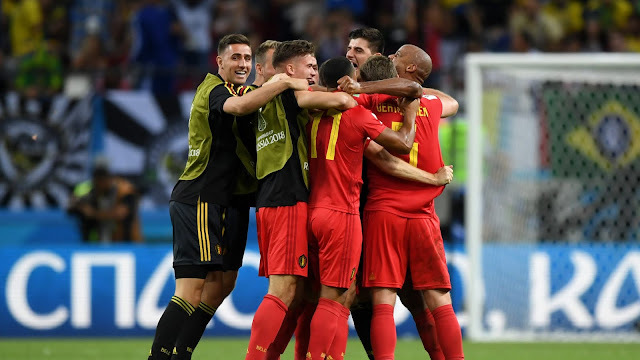 There is a steely determination about this Belgium side that they did not have four years ago when they narrowly lost a quarter-final to Argentina. Eight of the starting 11 against Brazil also started that game in Brasilia in 2014 but this time there was no hard luck story for the Red Devils as they ruthlessly dispatched the most successful country in World Cup history. 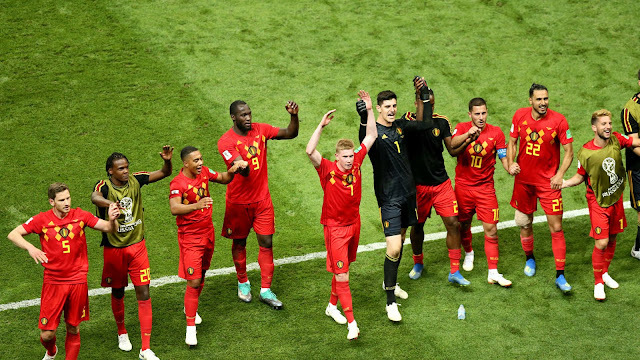 Energy and belief is coursing through a Belgium team packed with Premier League winners, and many are starting to seriously ask whether this squad full of thirtysomethings is finally about to deliver. If there was a touch of fortune about the first goal as the ball rolled off Fernandinho's arm and into the net, the second was beautifully crafted. Lukaku has scored four times at this tournament but his run which lead to De Bruyne making it 2-0 was a sight to behold, the striker receiving the ball inside his own half before turning and embarking on a superb run.